Mental health nurses at a London hospital are buddying with emergency nurses to improve care for patients in crisis, as part of a new collaborative initiative. People who come to the 136 suite are often in high levels of crisis and distress. The three-month project intends to develop a better care pathway for service users who have been detained by the police and brought to Northwick Park Hospital (NPH) as a place of safety, under section 136 of the Mental Health Act 1983 (amended 2007). The two sets of nurses swap skills and deliver training to each other at NPH, which is run by London North West University Healthcare NHS Trust. The hope is to reduce the number of patients with mental health problems coming into hospital through the emergency department (ED) and to transform care. Despite there being a legally designated secure place of safety at NPH, last year about 90 patients were admitted to NPH's 136 suite through the ED. A requirement of a recent pan-London section 136 pathway briefing is that nursing staff at any health-based place of safety should have adequate physical health competencies to prevent unnecessary ED referrals. One of the project's goals is to use targeted training to enable the mental health nurses at the 136 suite to confidently assess more physical conditions. Service users with physical problems such as head injuries or alcohol intoxication, or who have taken an overdose can then be monitored by the mental health nurses. RELATED: Is the ED the right place for someone experiencing a mental health crisis? These nurses have also been learning basic emergency care skills such as measuring vital signs, simple wound management and catheter care, so patients can be treated, where appropriate, in the 136 suite. In return, ED nurses are learning during five two-hour training sessions how to undertake risk assessments and how to have better communication with and manage people who have mental health conditions. The collaboration is helping improve patient journeys, laying the foundation for effective partnership. Senior nurses leading the project say the initiative has been focused on developing and increasing positive relationships between colleagues in the two departments. But there is more than just a gulf in skills between the two specialties; there is also a bureaucratic stumbling block. Although the nurses work at the same site, they do not have the same employers because the hospital’s mental health services are provided by neighbouring Central and North West London Foundation NHS Trust. ‘We are two different highly pressured services with very different levels of need,’ explains NPH mental health acute wards matron and project lead Sheelagh Holmes. ‘I wanted the mental health staff to understand the workings, pressures and experiences of the emergency services staff, both in the ED in everyday practice and also for users on the section 136 pathway. ED senior sister and practice development nurse Cassandra Kelly, who has led the project with Ms Holmes, says both sides shared training to enhance the other specialty’s practice. Mental health nurses have received relevant physical health training on toxicology, head injuries and specific wound care, while ED nurses learned about interacting with patients, observations, suicide awareness and the child and adolescent mental health service pathway. There was also a session on safe restraint and training in processes and legal issues. All nurses have had opportunities to shadow their colleagues on ‘dip-in’ shifts, which project leaders say have been crucial. The alternative, she warns, can be misunderstandings or ‘splitting’, a psychoanalytic term, which she describes as ‘us and them’, or black-and-white thinking. ‘Ultimately, the result is that things become less collaborative and service users have a poorer experience,’ Ms Holmes says. ‘The section 136 pathway service users have arrived in difficult circumstances and this experience can be distressing and frightening for them, so it is vital we are collaborating to make care more joined up and compassionate. ‘People who come to the 136 suite of the ED department are very often in high levels of crisis and distress. Ms Kelly adds that the dip-in shifts have helped change the perceptions of ED nurses, who were initially apprehensive about what this work might be like. ‘Some have been posted for a shift in the mental health unit and have not been sure what to expect,’ she says. ‘When we see those patients here in ED, they are usually in crisis, so we see them at their “worst”. Ms Holmes adds that these shadowing shifts have been such a success that they have decided to make attending one a requirement for induction for new staff members. As the project is aimed at transforming service user experience, the measurement of its success has been focused on a qualitative approach, using focus groups, questionnaires and forums with staff and patients. An important element, Ms Holmes explains, has been in providing spaces where ED and mental health staff can talk through the emotions and experiences of their work with service users on section 136 pathways. ‘There are high levels of distress for the service users, and often teams with staff receiving these people are geared up to working with high risk and high levels of distress. ‘We discuss what it felt like, what anxieties we had, and what people are feeling in relation to what the teams have been working with,’ she says. Ms Holmes and Ms Kelly say their nurses have given them positive feedback on the project and collaborative work will continue. ‘Feedback on training from our ED colleagues was good,’ says Ms Holmes. There are plans now for a monthly forum where service users who have been on a section 136 pathway talk about their experiences, and staff have requested that the training continues. ‘My hope is we keep the parts of the project that work around collaboration and relationship building, supervision spaces, dip-in shifts, and “knowing each other”,’ says Ms Holmes. There will also be another focus group and questionnaire in three months, which allows time to see what staff’s understanding of each other’s processes are and how care has improved. The project, which involves more than 30 nurses, is funded by Health Education England’s Urgent and Emergency Care Workforce Collaborative for London. In 2017, the RCN was instructed to lobby to ensure that emergency departments (EDs) were no longer used as designated places of safety for people experiencing mental health crisis. The congress resolution by the RCN's emergency care association and its mental health forum stated that EDs were noisy environments that were unsuitable places to wait for mental health assessment. Supporters of the resolution, which was carried by members, said that specialist mental health facilities, staffed by appropriately trained professionals, were the correct place for such assessments. 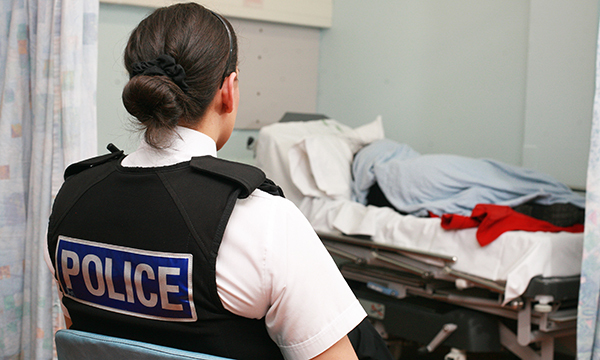 An agreement between health, police, social care and government agencies, the Crisis Care Concordat, had been introduced in 2014 to enable closer working between police and specialist mental health nurses to reduce the use of police cells as designated places of safety. Speakers in 2017 warned that stopping the use of EDs as places of safety could lead people with mental health problems to feel they were unwelcome.